As noted by both contemporary author Smith and the unknown eighteenth-century author, plagiarism is NOT your friend! Plagiarism is a form of academic dishonesty in which a writer uses other people’s words or ideas (pictures, art, charts, graphs, computations, scientific data, music, etc.) as his or her own. The writer may do this by failing to credit the others at all or by improperly crediting the creator. If you use someone else’s exact words, put quotation marks around them and give the person credit by revealing the source in a citation. If you use someone else’s ideas or revise, rearrange, or paraphrase their words, you still must cite your source. Otherwise, you imply that the words or ideas are your own. Some plagiarism is blatant and intentional. Unscrupulous students have been known to buy, steal, or copy an entire paper from the Web. You commit plagiarism if you hire someone to write your paper, copy chunks of someone else’s work without documentation, or cite fake information. Some plagiarism might be considered unintentional, such as missing or improperly citing a source due to carelessness (perhaps because a student is hurrying to do an assignment at the last minute). It may be possible to accidentally paraphrase too closely to the original’s wording—so closely that quotation marks should have been used. Or a writer might use other writers’ ideas by mistake without giving them credit. Sometimes teachers or administrators will try to ascertain whether a student intended to cheat, but some may say that any kind of plagiarism, intentional or not, is still plagiarism. 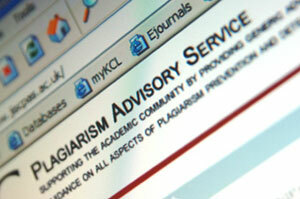 With that in mind, let’s look at ways to avoid even being suspected of plagiarism in the first place. Begin with the chart “Deciding When You Need to Give Credit,” in the previous section. When you know the theory behind what you have to document, you can create a real-world plan, a no-way-am-I-going-to-plagiarize process, using the chart below. This lesson is in both the writing and research modules, so the message is doubly loud and clear: You must learn how to collect and use source information ethically. It’s never too early to make a plan of action to ensure you accomplish these tasks successfully. Mark everything that is someone else’s words with a big Q (for quotation) or with big quotation marks or some unique way you devise. Indicate in your notes which ideas are taken from sources (S) and which are your own insights (Me). Record all of the relevant documentation information in your notes. First, write your paraphrase and summary without looking at the original text, so you rely only on your memory. Next, check your version with the original for content, accuracy, and mistakenly borrowed phrases. Begin your summary with a statement giving credit to the source: According to Jonathan Kozol, . . . Put any unique words or phrases that you cannot change, or don’t want to change, in quotation marks: . . .“savage inequalities” exist throughout our educational system (Kozol). Keep the person’s name near the quotation in your notes and in your paper. Select those direct quotations that make the most impact in your paper—too many direct quotations may lessen your credibility and interfere with your style. Mention the person’s name either just before the quotation, in the middle of it, or right after it. Put quotation marks around the text that you are quoting. Keep the person’s name near the text in your notes and in your paper. Rewrite the key ideas using different words and sentence structures than are used in the original text. Mention the person’s name either at the beginning of the information, in the middle, or at the end. Double-check to make sure that your words and sentence structures are different than in the original text. As you can see, avoiding plagiarism is even part of the proofreading process. However, since we’re planning ahead, it is wise to have a checklist to refer to during the entire writing process, not only at the end, to avoid inadvertent plagiarism. The Pearson Education Web site contains an extremely helpful checklist.